Product prices and availability are accurate as of 2019-04-19 08:11:59 UTC and are subject to change. Any price and availability information displayed on http://www.amazon.com/ at the time of purchase will apply to the purchase of this product. 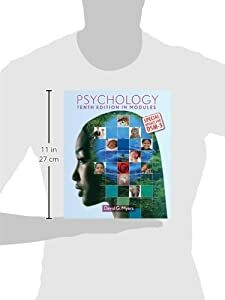 This modules-based version of Myers’ best-selling, full-length text, Psychology, breaks down the book’s 16 chapters into 54 short modules. Myers was inspired to create this text by the memory research in chunking (showing that shorter reading assignments are more effectively absorbed than longer ones), as well as by numerous students and teachers who expressed a strong preference for textbooks with more, shorter chapters. 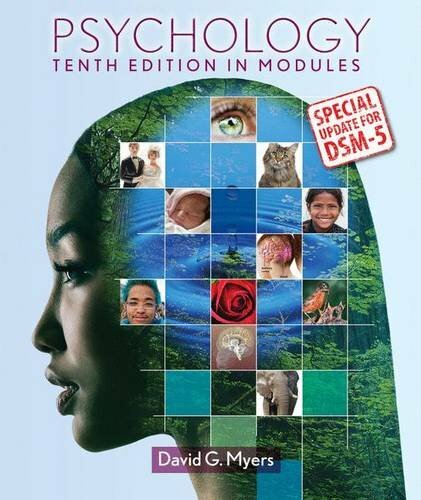 Available for Fall 2014 classes, this update version features new content from David Myers in response to the release of the DSM-5. This new content is integrated into the text without changing pagination or the structure of the chapters. A special DSM 5 Supplement by the David Myers is available for Fall 2013 and Spring and Summer 2014 courses. View the Page-Referenced Guide to the DSM-5 updates for Psychology in Modules. Watch our new videos from David Myers here, including our animation on THE TESTING EFFECT narrated by David Myers. For more information on the new edition of Psychology in Modules, please visit our preview site.